The debt crisis. The rise of the Tea Party. The “debate” about global warming. Consensus has gone AWOL. Can politics and media find the center, or have the spin zones pushed everyone to the extremes? I’m going to collect some thoughts in this post, using a Q&A format. Q: What does “broken politics” mean? A: People tend to mean one of two things. First, the political process is broken. Complaints about process involve different things—incivility, hyper-partisanship, gridlock, and so on. This is a complaint about means to ends. Second, they mean that the political system is unable to reach certain ends, which means people’s preferred policies. So politics is broken when the government can’t pass certain pieces of legislation, for example. Q: Why does this distinction matter? A: For two reasons. First, I think complaints about broken politics tend to involve the latter more than the former. Even when people complain about process, their complaints typically arise because their policy goals have been stymied. Complaints about gridlock usually don’t mean that people want just any policy to pass; they want their preferred policy to pass. Second, the two meanings of “broken politics” can imply very different solutions. If your concern is incivility or partisanship, then your solution is more consensual forms of decision-making. If your concern is policy, then you may not necessarily need to care about process. The easiest way to enact landmark legislation is often (mostly?) to get large partisan majorities and leverage their power, even at the risk of incivility or hyper-partisanship. Q: Is our politics more “broken” today than before? This means that a lot of “brokenness” is not simply the result of misbehaving politicians—as I’ve noted before—but the result of real disagreements about policy. These disagreements are simply difficult to bridge. Moreover, as Brendan Nyhan has emphasized, polarization may actually be the normal state of American party politics. The middle of the twentieth century, frequently the subject of some nostalgia, may be an aberration. That’s worth thinking about when we debate broken politics today. Q: Why does polarization matter? Assigning blame to the rules or to senators’ character is tempting, truly tempting. 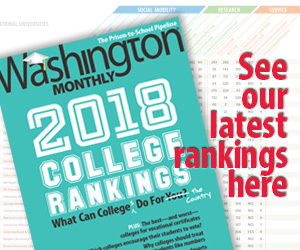 The Senate could (and should) have different rules and could (and should) have senators who allow institutional norms to trump their policy interests, but neither analysis is complete. Both credible accounts—the Senate as a bad set of rules and the Senate as misbehaving senators—miss a more important element of the story: Senators’ policy preferences, dictated by their political circumstances and personal views, are sharply polarized by party. There are few centrist senators who can successfully demand a deliberative, consensusâ€building process that produces constructive and successful compromises. 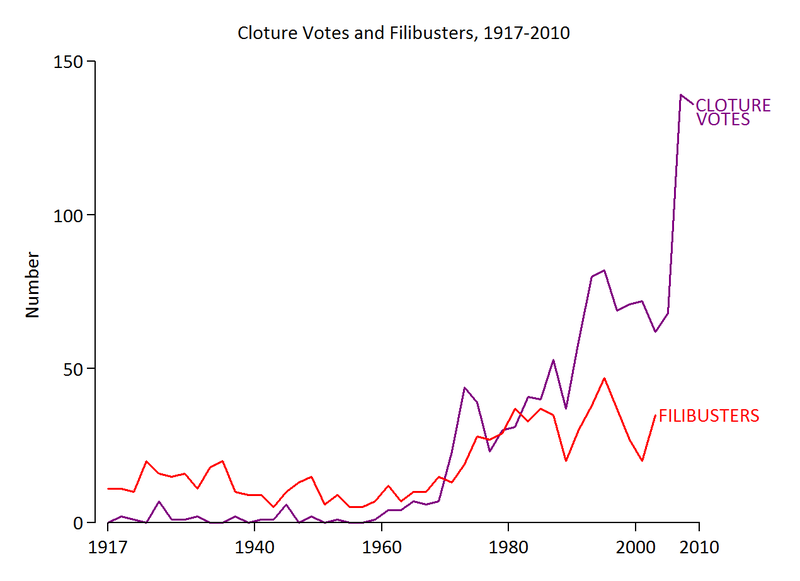 Few minority party senators withhold support for obstructionist maneuvers and few majority party members resist efforts to limit amending activity and invoke cloture. Each party’s leaders, guided by a consensus view among their fellow partisans, pursue strategies that perpetuate the obstructâ€andâ€restrict syndrome of the modern Senate. If you look not just at institutions but at public opinion, you’ll also see the importance of polarization. Although Republicans and Democrats in Congress are more ideologically extreme than the voters they represent, and although citizens do not have ideologies as cohesive as those possessed by members of Congress, you can still observe substantial differences between Democrats and Republicans in the public. The panel’s tagline mentions the “debate” over global warming. But the scare quotes obscure the fact that, in politics, there is a real debate. Yes, most Democrats and Republicans think that global warming is happening, but they disagree sharply over how big of a problem it is and whether humans are to blame. Q: So what might mitigate polarization? A: It’s important to note that polarization is not related to gerrymandering—see the trend in polarization in the Senate—or to the type of primary used in a state. (However, nominating via a convention probably did contribute to Bennett’s primary loss.) So electing more moderate legislators is not a matter of letting independent commissions draw district lines or allowing independents the opportunity to vote in party primaries. Electing moderates is more a matter of political power. Take Seth Masket’s book, which I discussed here. Seth finds that polarization in the California state legislature happened as ideologues gradually took over local party organizations and networks. Indeed, party activists nationally have become more ideologically extreme. Given that today’s panel ostensibly involves the rise of the Tea Party, I’d say this to Tea Party opponents, especially within the GOP: the most obvious antidote to Tea Party “crazies” is to get your own band of crazies. In other words, out-organize and out-vote them. The problem, of course, is that the political extremes are much more enthusiastic than the political center. Q: Does the media have any role to play? A: In terms of polarization, I wouldn’t put the media front and center. 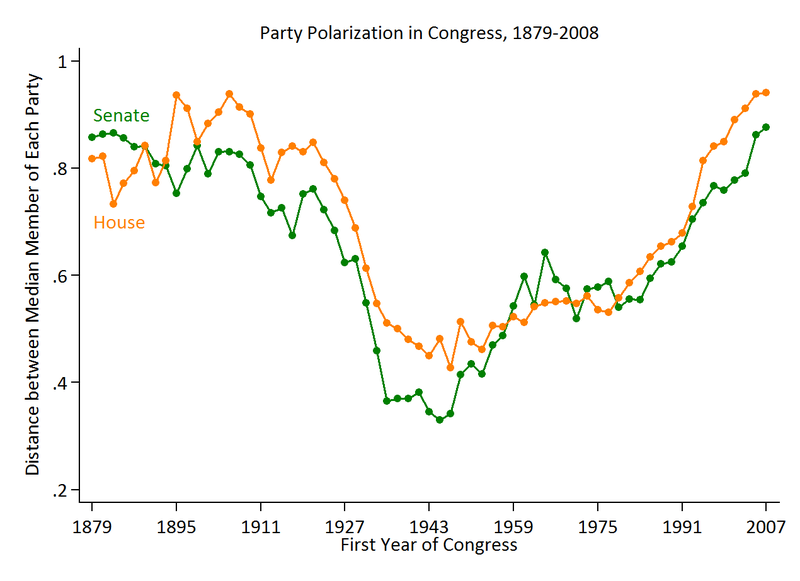 The trend in party polarization began before most of the media bogeymen—e.g., cable news, blogs—even existed. But I do think today’s media landscape doesn’t facilitate any lessening of polarization. On the GOP side in particular, partisan or ideological media outlets often police deviations from conservative orthodoxy. That, combined with the threat of primary challenges (whether real or perceived), may help keep GOP politicians in the fold. Another objection about the media is broader: it merely reports on political debates and fails to referee them, perhaps giving the misimpression that there is a scientific “debate” over global warming, for example. If our “broken politics” is facilitated by the unavailability of truth (no scare quotes there), then we do need a different news media—one that is willing, to quote Brendan again, to “name and shame” or at least call balls and strikes. Q: The panel will inevitably talk about the Republican presidential nomination. You’d better have something to say. A: I see endorsements by party leaders during the invisible primary as the most important indicator of who is leading and whether the party is coalescing. At the moment, according to the data Mark Blumenthal has gathered, the pace of nominations is slow. This suggests that the GOP isn’t coalescing quickly. At the same time, according to Nate Silver’s tabulation, Romney is leading and—perhaps more importantly—there are signals that even some conservative elites (e.g,. Hannity) may be willing to support him. And he’s not that unpopular among conservative Republican voters. So while the GOP certainly has divisions (see Matt Bai’s exploration thereof) I think those divisions are growing weaker, not stronger, as the primary season approaches.